Shout out to Laughing Squid for breaking this story, which we caught over at SFist. Here we have some original Super 8 footage of the Man being burned in 1990. We’ve written about the history of Burning Man before here, and mentioned it more recently here. Although the video shows a statue of a very familiar looking Man, the event itself was not called Burning Man at this time. It was still promoted as part of the Cacophony Society, and there was only one portapotty. Gnarly! Laughing Squid points us to some of their historical coverage of Ye Olden Dayes of Burning Man. 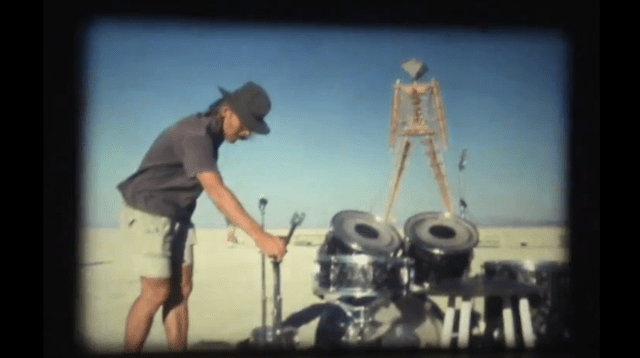 In September 1990, Bob G. captured this Super 8mm film footage of San Francisco Cacophony Society’s Zone Trip #4–”Bad Day at Black Rock“– the event more commonly known now as Burning Man. 1990 was the first year it was held out at Nevada’s Black Rock Desert. I get a sense that in these early days, “creating a temporary city” was more of a priority than “burning an effigy”. Did that ever change? Or did the rave culture then appear, and “throwing a party” took over as the prime directive?